The perfect combination of style, simplicity, and elegance. Built strong with a fully fusion-welded sash & mainframe, metal reinforced operating and locking attachment. Ever want to enjoy the great outdoors, but from the comforts of your own home? If you’re looking for a window that will provide functionality and design, casement windows from Window World of Central Valley may be just what you need! Our casement windows feature a simple design that offers maximized glass space, which allows in more sunlight and opens up your rooms to the wonders of nature outside. You can also open up one portion of the window to allow fresh air into your home. And beyond that, our casement windows are also energy-efficient, keeping the air you’re paying to heat or cool inside your home. Low-profile, single-handle positive locking system provides ease of operation. Color-coordinated hardware gives windows a beautiful,clean look. ClimaTech Insulated Glass Package featuring Low-E Glass & The Intercept™ Warm Edge Spacer System, for enhanced insulating performance. Standard,contour or brass grids-placed between the panes for easy window cleaning. Specialty grooved glass panels for a truly custom look. Think casement & awning windows could be right for your home? 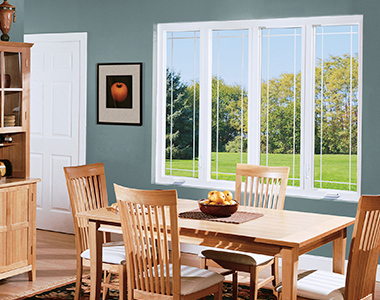 Contact Window World of Central Valley today for your free in-home estimate!